OH … cake! Was it as yummy as it looks? Yup. Pudding in the middle and everything. This is wonderful! And intriguing. What’s this about a “found” truck? Who’s “Lorie….” (couldn’t’ make out the whole name!) 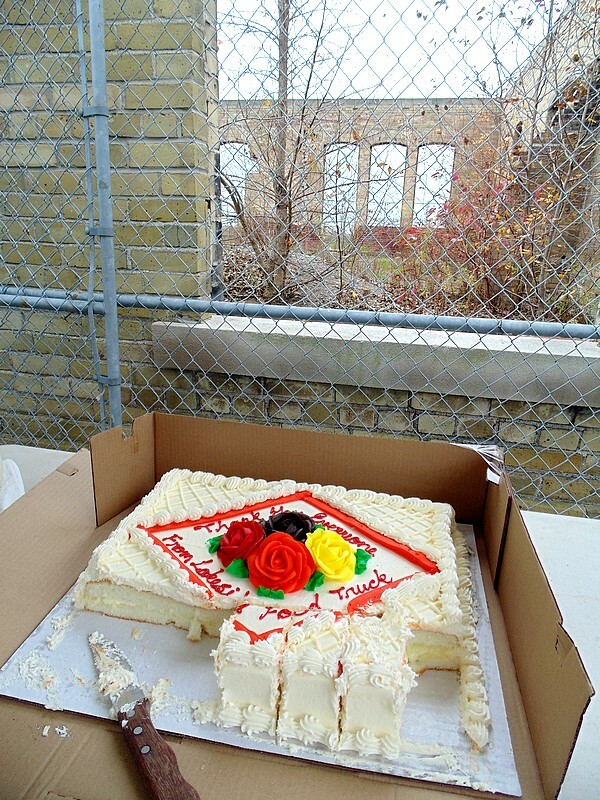 — and what a great contract: the yummy dug-into cake against the chilly outdoor wire-framed scene! Now tell us about the party!!! It says: “Thank you everyone, from Lakeside Food Truck”. It’s the chip truck at the beach, run by a woman named Jenny. She’s just the sweetest. And her food is excellent. So this was her last day of the season and she had this little ‘event’ to show her appreciation. Free cake AND a guy singing oldie country songs through a sound system they’d rigged up in the parking lot. It was raining and windy and the whole scene was quite mad. But we loved it of course. Beyond the wire fence and the tumbled down brick wall is Lake Ontario. I liked the juxtaposition. Yes, well, both sweet tooth and savoury one were appeased on this occasion. My favourite chip truck’s end of season thank you to customers. Had a burger and some fries along with a slice of this… And then a five hundred km walk. This has more than a hint of hmm, Carin! There’s quite a contrast between the cake with the colourful icing-flowers (recently sliced, it would seem — by whom, we wonder, and for what occasion?) set against all that incongruous setting: chain-link fence, brick wall, foliage, another wall, lake! I love that the cake is partly eaten, pieces with the most icing going first, of course! The word “Truck” really piqued my curiousity!